Joe enlisted in the army in 1940 and was soon posted to the Commandos. He was in the first group to land in Normandy on D-Day. He then became part of the personal protection group to FM Montgomery. Joe obtained a commission with a Sikh Regiment in India but returned to the British Army and the Royal Army Service Corps in 1947. He retired as a Major in 1978. He was also a keen sailor. What is interesting is that while at Hereford he kept a journal - I am keen to learn more about this - at the memorial service his son Huw read out a poem that Joe had written during his school days. Joe Humphreys was fortunate to go to Hereford Cathedral School while his father was the headmaster of the small village school in Llanhamlach outside Brecon, in 1935. Following his father’s death in 1939, Joe left HCS at the end of the summer term 1940 (when this picture was taken) and moved with the family to the Uplands in Swansea where his mother had bought a house that is still the Humphreys “family home.” At Swansea he finished his schooling and was a runner for the local ARP Warden Post during the Swansea blitz before moving to Newport to work as a fitter in an aluminium factory. Whilst at HCS he loved geography, something that his later career employed fully, the OTC and English. From his experience of singing descant in the school choir, he fell in love with choral singing and this stayed with him all his life. As we were preparing for a celebration of his life in Brecon Cathedral we discovered an autograph book that he kept, up to the end of his time at HCS. It is full of pictures, schoolboy-level humour and rhymes, and give an insight into the mental world of a teenager at HCS in the thirties. Pictures from that time show him alternately serious-minded and surrounded by friends – one great picture is of his winning a tug-of-war competition, with him in the anchor role. Joe joined the army in Newport and was sent to the Royal Welch Fusiliers at Dering Lines in Brecon in 1942. After (apparently) learning to ride a motorbike while there, he decided against officer training and volunteered for the commando training battalion in Achnacarry. He was posted to 12 Cdo and did the Snow and Mountain Warfare course in Braemar (stories of living for three days wearing just a string vest in an igloo on Ben Macdhui! ), before being posted to the Shetlands to work with Norwegian troops at HMS Fox. This was followed by parachute, demolition and flamethrower training, all in preparation for D-Day. 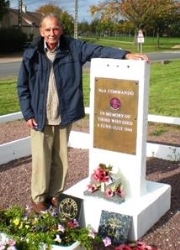 By now in 6 Cdo, Joe landed at the easternmost section of Sword beach on the Caen canal in June 1944, and with other commando units fought their way to Amfreville, where the 6 Cdo memorial still stands. A stint as Montgomery’s bodyguard followed before he was posted to India and where he received a commission in the Sikh Regiment in 1945. The war ended and Joe was posted to Nowshera (in northern Pakistan today) to work as a transport officer for the Sikh Regimental Depot, and then to Quetta. Joe loved the Sikh Regiment and stayed conversant in Urdu for many years. In 1946 he applied for a regular commission in Bangalore and was posted to the RASC, which he stayed in (and its successor, the RCT) for the next 31 years, working in Singapore, Hong Kong (two postings), Germany (four postings), Malaya (during the emergency) and the UK. He was promoted to captain in 1950 and to major in 1957, the year he married Edna Makepeace, formerly a QA nurse. After retiring from the army in 1978, Joe worked as a schools liaisons officer for HQ Wales for ten years, was active in SSAFA, and lived at his hillside home, Tylwyth Teg in Brecon, which he bought after Edna died in 1978. The house was a huge source of pride and joy to him, and the setting for annual gatherings of the wider family known as the Cousins’ Curries. He lived in the house to the day of his death, 16 July 2018.